I have come across two times where Jesus literally showed his light in the world. We are not to look for signs and wonders, yet God sometimes blesses us with unexpected wonders. The photo above was a miraculous light that came from the Eucharist in a chapel in Father Robert Lange's Fort Valley, Virginia home. Anita Crane, wrote about iton her blog in 2015, describing her former pastor (now deceased),as a humble and loving priest. He served at her parish, Our Lady of Angels from 1999 until 2005 and died last May at age seventy. (His obituary is here.) His memoir called Windows into the Life of a Priest, can be ordered here. Reverence for the Holy Eucharist was of utmost importance to Father Lange. He stressed that even the smallest particle of the host is the Body and Blood of Christ. When he was ordained in 1986, he was a proponent of receiving Communion in the hand, but time changed his thinking due to witnessing many abuses and lack of reverence. Father Lange had permission fromhis bishop to reserve the Blessed Sacrament in the chapel on the second floor of his house. The picture was taken from the porch of a neighbor’shomewho simply was outto capture the beauty of the valley. 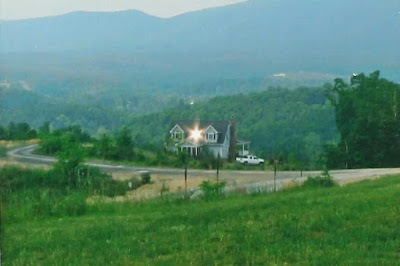 “When she aimed the camera towards the valley and tried to focus for the picture, she says the light coming from my house was so brightshe saidit was difficult trying to look into camera to view the picture to be taken. (It was a cloudy day and I did not have a light on in the room/chapel where the light is coming from.) She took the picture and the image – the Star of David – is what came out on her digital camera. She did not know what to make of it. Not being Catholic, she had no understanding of the Sacrament of the Eucharist (Holy Communion). The second picture was taken outside the home of Rhoda Wiseduring one of Jesus’ appearances to her in 1940. When she died on July 7 in 1948, more than 14,000 people attended her funeral at St. Peter’s Church in Canton, Ohio. Rhoda interceded for the healings of many people, including Rita Rizzo who was to become the world-famous Mother Angelica, founder of EWTN. Rhoda herself received two dramatic healings during a visit of Jesus and her beloved St. Therese of Lisieux.It was during a time she was sent home from the hospital to die after doctors determined there was nothing more, they could do for her. Rhoda would later become a stigmatist and receive numerous more visits by Jesus and St. Therese. There we times when Jesus told her the day that he would return the following month. 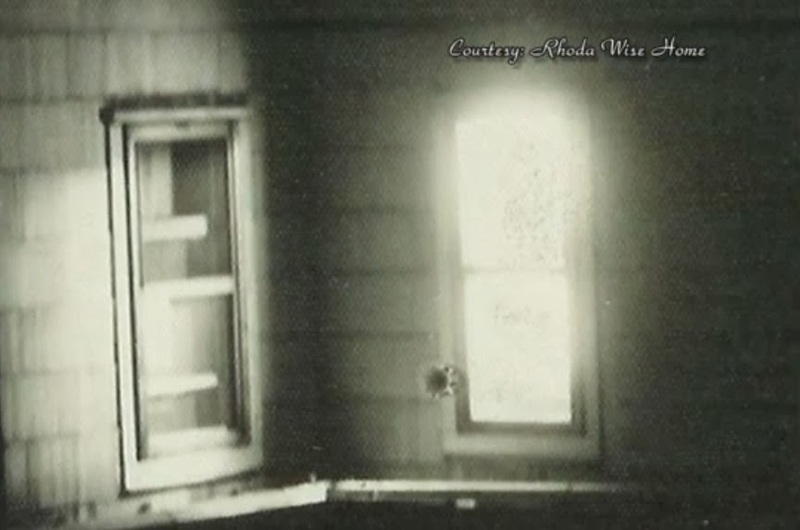 At such times, crowds gathered outside her small depression-era house, and one time, the light that shone from her window was photographed. There was no electrical light turned on in her room at the time. Rhoda saw Our Lord and St. Therese a total of twenty times. She suffered the visible stigmata every First Friday from 12 to 3 p.m. from 1942 through 1945. During the last two years of her life, Rhoda suffered invisible wounds. The Diocese of Youngstown, Ohio, formerly opened her cause for beatification and canonization on October 7, 2016, putting her on the path to sainthood. In both these pictures, we see that Jesus really is the light. And we can receive him and visit him in the Eucharist every day where he dwells in our midst.